I’m giving you permission to check your phone. You’re at the dog park. You’re watching your kids’ baseball game. You’re having lunch with friends. You’re watching a movie with your significant other. You want to check your phone for messages, but you don’t want to look like “that person”. You know the ones. You’ve seen them having dinner together, both checking their phones. Sometimes I wonder if they’re texting each other instead of having a real conversation! And your KIDS! They don’t even use their phone to actually talk to people anymore. When you ask them if they’ve confirmed their plans, they say “they’re waiting for a text back”. When you suggest they actually CALL the person, they look at you horrified. And then there’s this guy. I know I feel like this sometimes, how about you? It’s a dilemma. I’m a Social Media Strategist. I teach people how to run their businesses virtually. My business is set up so that it can be run from anywhere, my clients all email or text me. I teach Conversational Marketing, how to communicate with YOUR customers virtually to bring in more sales. How to you do that if you don’t always check your phone? Before we get to that, I want to first let you off the hook. YOU’RE AN ENTREPRENEUR! Of course you’re always checking Social Media! That’s how you get new business. So you are going to be that person checking the phone at the dog park and at the dentist office. You’re a Social Media ROCKSTAR, and you want to be responsive when you can. That’s the beauty of running a virtual business, so give yourself permission to be that person. Let’s talk about when you’re with your friends/kids/significant other. And when you have to actually get some work done. You must be present. Fully present. When you stop for ice cream on the way home, leave your phone in the car. When you’re watching a movie with your honey, turn off your phone. When you go to lunch with your friends, put your phone on silent. But when you’re waiting for your kids to come off the soccer field, it’s OK, it really is, to check on your business. 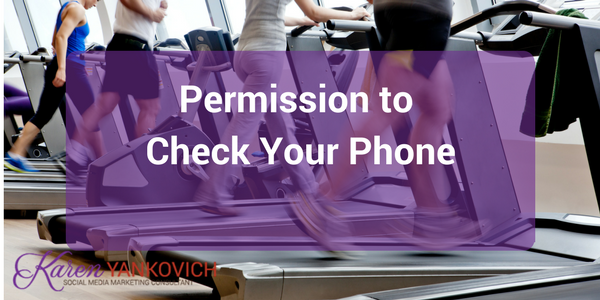 So go ahead, sneak a look at your phone while you’re on the treadmill. Here’s the other thing. 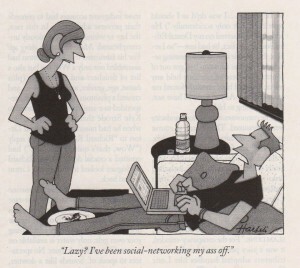 You get more accomplished when you unplug from Social Media. Literally, sitting at your computer WITHOUT your email or Facebook open. Try it! Put a timer on and commit to 30 minutes of time, unconnected. You’re going to be blown away by how much work you get done. You’ll get four hours of “interrupted” work done in 30 minutes of “uninterrupted” work time. It’s like giving yourself more hours in each day. It’s not an easy balance! We Online Marketers need to be more conscious than most about being fully present. We need to be fully present when we’re working, we need to be fully present when we’re with the people we love. We don’t work M-F 9-5, most of the Online Marketers I know barely take one day off a week, never mind two. It’s OK to often check your phone when you use Social Media to have conversations with your tribe. Your work and your relationships will benefit by regular “unplugged” time. It isn’t mutually exclusive. You don’t need a Social Media Intervention. You just need to remember that it’s sometimes OK to be checking in, and it’s sometimes OK to be unplugging. I’ve got some favorite tools that help me with that balance. You can check them out HERE (link no longer available). I think you’re going to be surprised by one or two! So tell me in the comments below, what are your tricks for staying present, for unplugging from Social Media? And let me know if you’ve tried any of my tools, better yet, if you’ve got a tool to add to the list.